Snapeez® Snapping Jump rings! Turn an open jump ring into closed - with no solder - just a brush, snap and wiggle!! I'm truly amazed.. these are incredible! 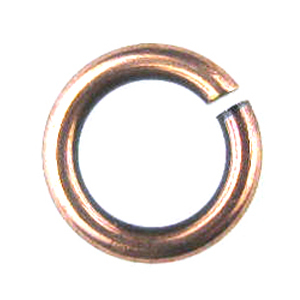 Flamed Copper Ultraplate®, 14mm, sold in packs of 6. "Ultraplate® is a new registered trademarked plating process. Ultraplate® results in a plated surface that is seven times the thickness and significantly more durable than the industry standard used on most fashion jewelry components. High-quality brass smothered in 99.9% pure silver, 24 kt. Rose Gold, 24 kt. pure gold, flamed copper, or black nickel is a powerful combination. Premium design elements with Ultraplate® are high quality products that allow for the same look, feel and integrity of expensive sterling silver and/or 14 kt. gold-filled at a lower price point."